Like it a lot, but don't have 15K laying around! Nice car and priced right based on the limited pics. Wish I had the 15k laying around too. I don’t think I have ever seen a 72 with 73 stripes. That grill is suspect too. Unless I’m wrong, it looks like a 71 grill. I wonder what the story with that is. Is strange to see 73 Mach 1 stripes on this 72, since the 71-72 "Boss" stripes and Mach 1 decals seem to find their way on just about everything including 73 Mustangs. Still a nice car and could be made correct with little effort. 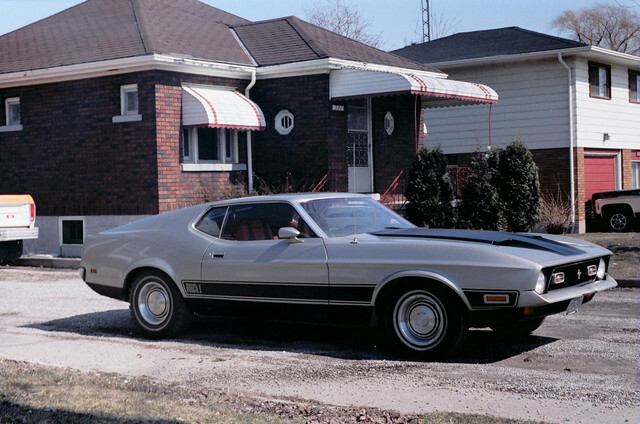 Here's my 72 351C 2V Mach 1 back in 1981. I bought this car as a parts car for 500 bucks cdn. The engine was sludged up and the lower quarters were rusted out. At the time I also had the red 351 C 4V Mach 1 and I intended to strip the disc brakes and PS off it. Instead I cleaned out the engine got it running and fixed the body. It was repainted in the original Light Pewter and a buddy who had a 73 Mach 1 gave me all but 1 small piece of the stripe kit, so I put it on and just painted in the missing piece. That was my winter beater. Note the snow tires! Well said Steve. I've been looking for examples with good documentation. The before 1/72 is still good for change. Tough to nail down. So still speculating!!!! !